A small entry just to keep this going and present a re re re... REissue of previous series Soldier Force figures. Sort of strange when TRU can count on the SFVII molds now. But, I can only imagine how many of these bulky figures they still have in stock to start inventing color schemes. Figures: Major Macintyre and Col. Hawk (Stewart repaint) now with a G.I.Joe Flint look and both in desert fatigues... not bad. I'm actually a fan of repaints like this because when executed properly, they can work wonders. These, I love. 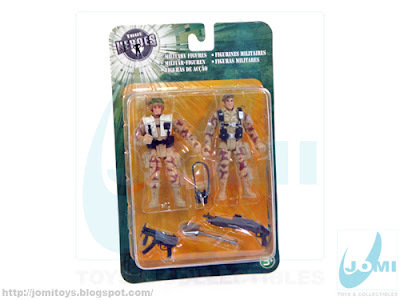 The Soldier Force sculpts have been done to death, and desert camo gives them a refreshing new look. Not a bad job for a re-re-release, at all! Bootleg Toys: Another unknown figure!